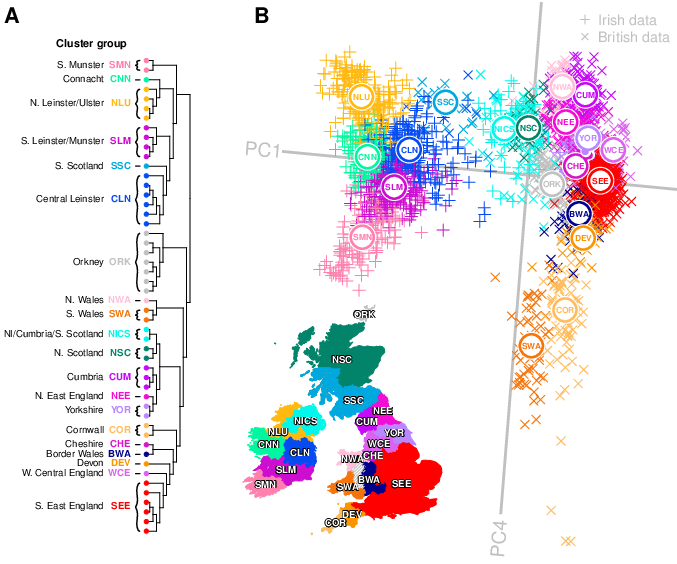 FineSTRUCTURE analysis demonstrates that haplotypes mirror geography across the British Isles as illustrated in A.) FineSTRUCTURE clustering dendrogram B.) Principle Component space. Administrative boundaries in map sourced from GADM (https://gadm.org). A recent study in PLOS Genetics has revealed a previously hidden genetic landscape of Ireland, shaped through geography and historical migrations. The genome-wide study, led by Ross Byrne and Russell McLaughlin of Trinity College Dublin in Ireland has discovered distinct genetic groups within the Irish population. In the 10,000 years that people have continuously inhabited the Ireland, distinct cultural and geographic regions have been established. However previous studies failed to find any clear genetic groups within the Irish population. In this most recent study however, the researchers took a more detailed look at genetic diversity across the islands, analysing genetic variation across almost 1,000 Irish genomes and over 6,000 genomes from Britain and mainland Europe. It was revealed that there existed 23 distinct Irish genetic clusters, separated by geography. These clusters are most distinct in western Ireland, and less pronounced in the east, where historical migrations (to Scotland and the like) have erased the genetic divisions. The researchers took into account genetic contributions from people with British ancestry, and discovered a clear trend showing input from Britain dropping off in populations to the west. Genetic input from Europe was also detected, and researchers were able to estimate the timing of the historical migrations of the Norse-Vikings and the Anglo-Normans to Ireland, yielding dates that were consistent with historical records. These results create a vivid and more complex image of the genetic landscape of Ireland, demonstrating the signatures that historical migrations have left on the modern Irish genome. The study also shows that a distinct genetic structure can exist, even within small, isolated populations. Perhaps this newly revealed structure should be taken into account in future studies that use the Irish population to identify the genetics underlying various traits and diseases. You can read about the study here.